"Each time someone talks to you, each time you hear a sound, you should create music and a rhythm. Go beyond what your senses can reach revealing the hidden harmony. Create music, listen to it, live it and enjoy it. This is how you learn to have a deeper insight into things and become one with them." Every sound, from the most melodic one to the everyday sounds of the roaring city, the sound that calms us down and the one that sounds as pollution to our ears, all sounds have rhythm and harmony. And this is exactly why every sound is actually a jewel that we can enjoy or even create ourselves turning our life into a harmonious symphony. Keeping this in mind, we created this music cd. Besides, the multilateral action of Omilos Eksipiretiton (the Servers' Society) in self-awareness, offering to the people, in philosophy, in letters and science, could not but include music as well since music vibrates our whole being and uplifts our soul. 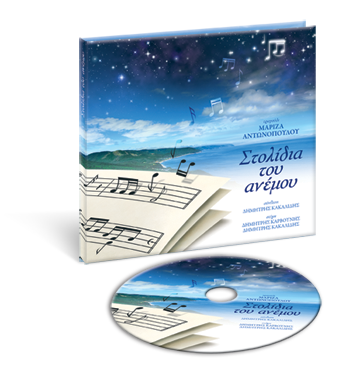 The cd consists of ten tracks, the music is composed by Dimitris Kakalidis and the lyrics are written by himself and the poet Dimitris Karvounis. 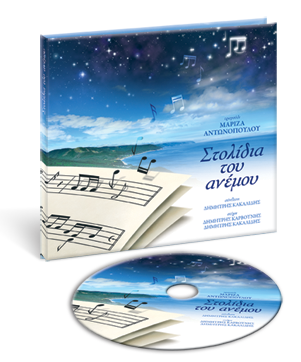 The music is orchestrated and the songs are performed by Mariza Antonopoulou, a new artist, member of the Society. As she wanted to express her love for music and the unity she experiences with the constant melody of life itself, she coordinated a group of musicians and members of the Society to make this cd happen. The cd is released by EMSE Cultural Action and the recording took place at Arion Music Studio. 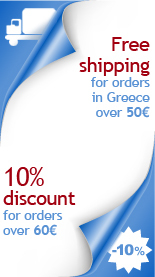 On Saturday 21 January 2012 a presentation of the CD took place at IANOS bookstore in Athens. Mariza Antonopoulou enchanted the whole audience that had filled the room and carried us away with her beautiful voice and her performance. The «Jewels in the wind» is available in the biggest music stores.